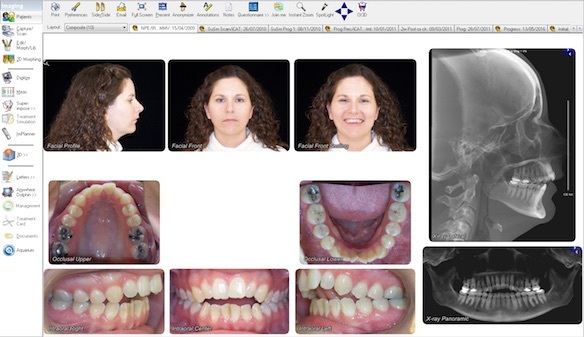 Effortlessly manage patient picture and x-ray images. ImagingPlus™ is the foundation of Dolphin product suites. Carefully designed for quick learning, ImagingPlus™ lets you effectively capture, organize and present image records. It also includes a set of powerful and user- friendly tools for conveying treatment plans and to easily communicate ideas. Simulates	frontal	views:	maxillary	impaction,	mandibular	reduction,	etc. Quickly	search/sort	the	entire	patient	database	using	name,	age,	gender	and norm. Other	criteria:	address,	telephone	number,	referring	doctor,	treating	doctor, treatment	diagnosis,	etc. Even	search	based	on	cephalometric	measurements (when	used),	like	incisor	overjet,	mandibular	plane	angle,	etc. Prerequisite	to	many	other	premium	Dolphin	products:	AnywhereDolphin.com, 3D,	Letter	System,	Aquarium,	Dolphin	Management,	etc.